Do you remember standing in front of your locker with a blank look and a cold sweat? We’ve all forgotten our locker combination at least a few times. Even as we get older, it only gets harder remembering all those numbers and turning right, left all the way around once, left, right. 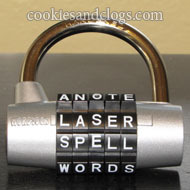 WordLock has created a simple yet ingenious solution – a combination lock based on words and letters instead of numbers! I was able to work with two different varieties (of seven available). One was the standard padlock. It feels very solid and the curved arm is a good diameter to fit most applications. The other was the luggage lock. Meeting with TSA guidelines, this lock can be opened by airport security with a special key instead of agents having to cut your lock off. It was very easy to choose and set your own combination on both but they are designed in a way to prevent accidental re-setting. On a lock with four letters, it is possible to create up to 100,000 different combinations. Just deciding on only one is the hardest part! Since you are choosing your own, it is so much easier to remember the right combination. But, like a password, only you will know it. WordLock products are available in various colors and at retailers nationwide. 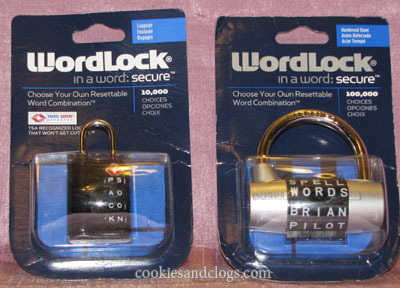 WordLock is offering one of my readers the same locks I received (padlock and luggage lock). Visit WordLock and tell me which lock you like best and why. Disclosure: I was provided with a two locks to facilitate this review. The opinions expressed here are 100% my honest opinion. I like the Wordlock paddlock. I folllow on GFC as frugal tumbleweed acres. I like the Padlock in Pink the most, I’m in the military, and this would be great to put on my seabag! i like the utility locks and brass locks, i like how they look. Like Harry Houdini, I collect locks. I’d like to win a Wordlock padlock as to increase the size of my collection. My favorite lock is the Discus Lock. It’s shielded design resists bolt cutters, so even the sneakiest thief is at his wits end! Love that! 🙂 Thank you. I like the Wordlock padlock – looks good and very secure. I don’t fly much any more, but the padlock would be great for me since I go to a gym and I need my own lock to lock up my stuff while there. I like that you cannot reset it by mistake! And I always seem to forget my combination!! Letters would be easier than numbers any day. I would get the chocolate caramel brownie bites! This was posted accidentally here. Please remove. Thanks. I like the Padlock in Red. I just like the color and the style of the lock. I love the bike lock because mine is a little stubborn and I think it would work great. I like the Discus lock. You have just voted for Cookies & Clogs! Remember, you can vote every day. I would like the bike lock for my grandson. I like the Wordlock padlock. I like the spell lock. it is sometime easier to remember a word than a number. At least for me anyway. I like the Worklock best because there are so many numbers in everything right now and I think it would be easier to remember words. I like the red luggage wordlock – same color as my DVF luggies! I like the blue bike lock, since I think this would prevent me from forgetting any more numbers. I like the mini cable locks, so I can keep my bike helmet attached right to my bike! I like the bike lock, because it is 5 feet long and nearly a half inch thick. It reaches around benches, trees, and fence posts and is bound to keep my baby safe! I like the bike lock so I can use it on my stroller too. I like the Wordlock Padlock in Pink! Mini cable lock because it is four feet long for maximum flexibility, and it’s lightweight. 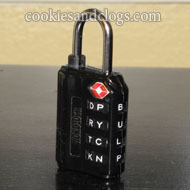 I like the standard word padlock…I love that you can create a word instead of numbers…much easier to remember. I like Wordlock on Facebook. This is such a simple, yet great idea. I like the bike locks cause use Heavy-duty braided steel cable and the word lock. Great giveaway, thanks. Voted at TMB, you are #57. I like the luggage lock best because it seems I am forever losing my key to regular locks and the password would be easy to remember! I’d like a luggage lock in neon green. Sorry, forgot to say I’d like the luggage lock because I travel a lot and I want my things to stay safe. Neon green because it’s so unique. Wordlock because it would be the easiest for me to remember.